I’m back from Ecuador! I had a amazing trip, as you can probably tell if you were following my Twitter or Instagram. Thank you again to sponsors KLM and Quito Turismo UK for making my visit possible. 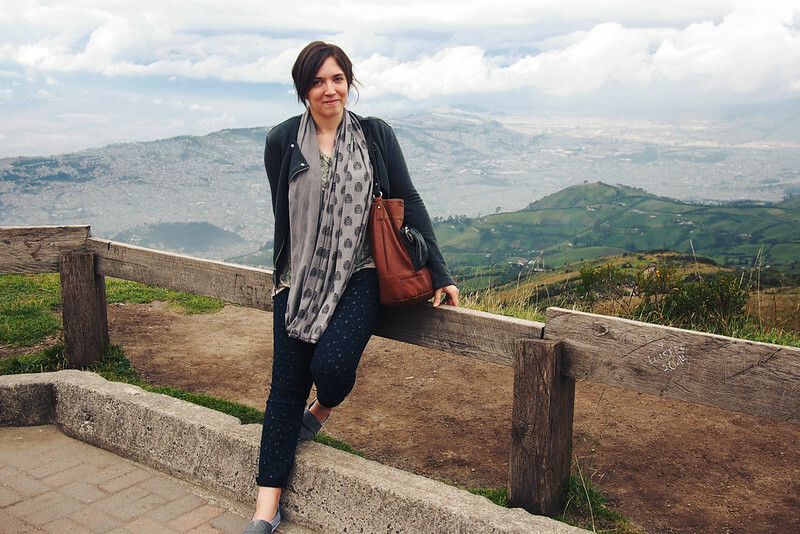 I’m going to write my usual daily diary of all the fantastic things I saw and did, but first here are a few general facts and tips about Quito and Ecuador if you know as little as I did about this beautiful country. Ecuador is about the same size as the UK area-wise, with 15 million inhabitants. It’s split into 24 provinces, from the coastal Manabí to jungle of Sucumbíos, with the Andes of Chimborazo running down the middle. It borders Colombia to the north and Peru to the south, with a Pacific coast on the west. 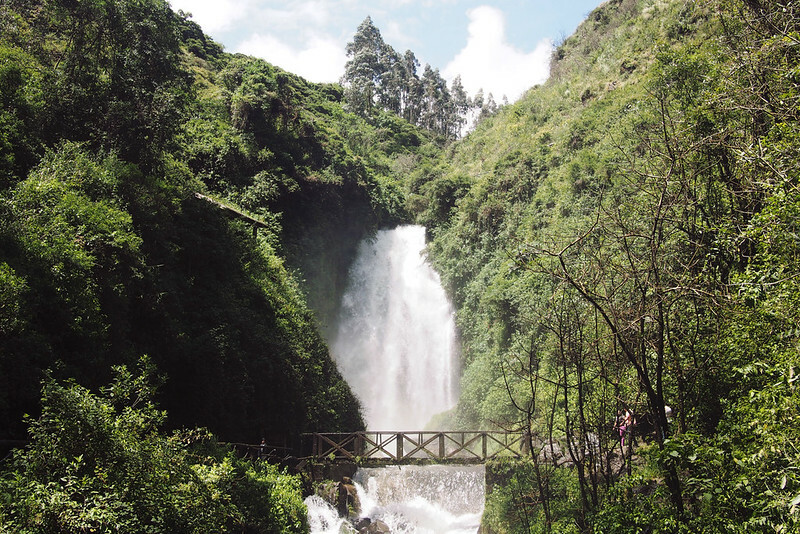 The varied landscape and interesting anthropological history of the country mean you can see a massive variety of scenery, nature and lifestyles just by travelling a couple of hours in any direction from the central capital city, Quito. Of course there are also the Galápagos Islands a two hour flight away, which I did not see this time. 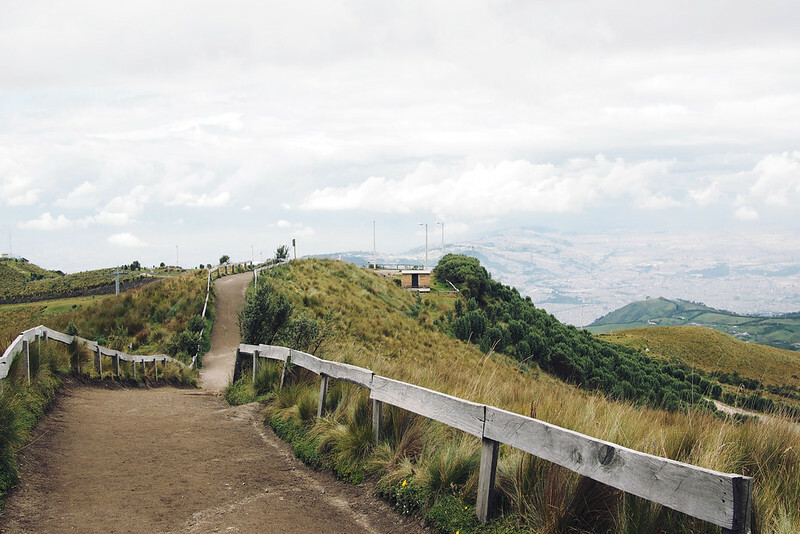 The Quito tourism board are keen to divert visitors away from Galapagos as it has become vastly over-visited, to its environmental detriment, and instead to promote Ecuador as a destination in its own right. There’s certainly enough to see and do here to justify that! KLM flies to Quito and Guayaquil daily via Amsterdam from several UK cities. You get a little Cityhopper to Amsterdam which barely takes any time at all, then the long haul is about eleven hours from there. The transfer is simple – I was a bit worried as it was my first-ever totally solo flight but it was really straightforward! I found the journey comfortable overall, with decent food and a great selection of films to while away the time. You can read a bit more about my flight experience here. Quito has a brand new modern airport which is close to the centre, but the access road is currently too narrow and traffic is common – a new road is being constructed right now. A taxi into town only costs $20-30 though. 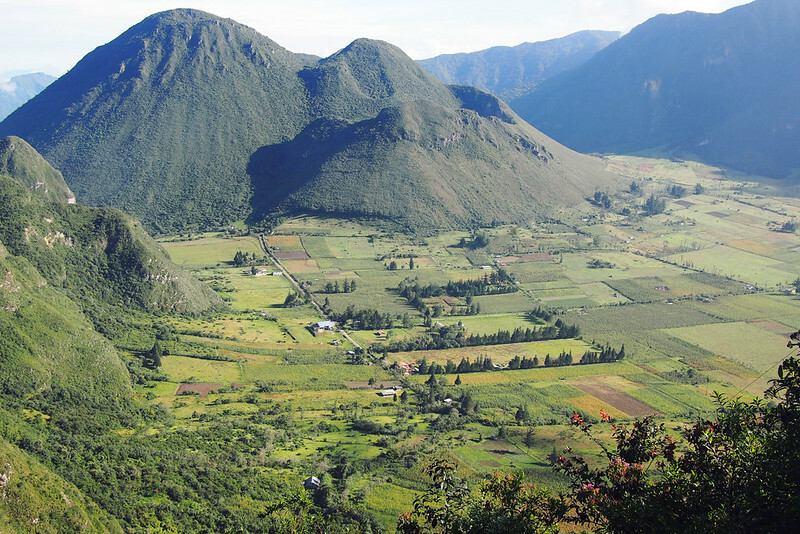 Most of inland Ecuador is at high altitude – 2000-4000m above sea level. Surprisingly I didn’t notice any ill effects but some people get dizziness, breathlessness, fatigue and headaches. Be sure to carry water and take regular breaks in the shade when you’re out and about. I never tired of seeing the hills peaked with clouds; a reminder of how high up you really are. The rolling valleys and hills make for some extremely breathtaking (literally, ho) scenery. The year is split into wet (Dec-May) and dry (June-Nov) seasons, although it varies a little depending on if you’re at the coast or in the highlands. While the temperature may hover in the teens and low twenties, it feels much hotter due to the strength of the sun at the equator. So pack suncream, a hat, sunnies and shorts – plus mosquito repellent if you’re going into the forests. For my late May visit it only rained in short bursts in the evening and night (plus a couple of lively night-time thunderstorms) and was warm enough for bare arms and legs nearly all the time. The currency is the US dollar. Food, transport, souvenirs and most other things are pretty cheap. 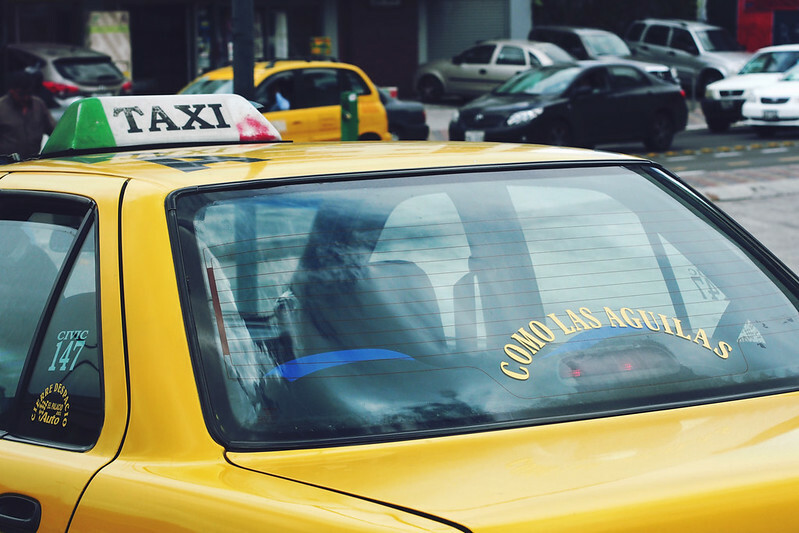 Expect to pay $3 for an in-city cab ride, $1-3 for museum entry, 20-50 cents for a street snack and maybe $20 for a higher end 3-course meal with a drink. 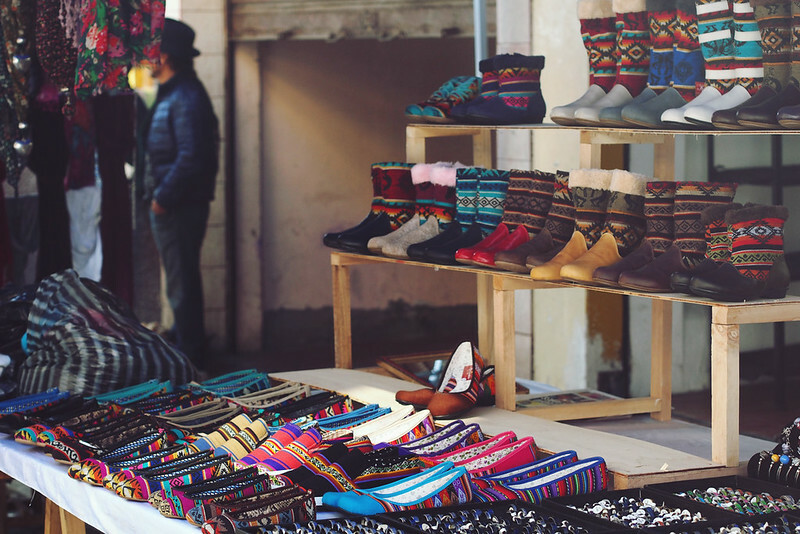 There are lots of markets selling the gorgeous local handcrafts – more on those later, of course! The cost of accommodation varies depending on what you go for: there are chain hotels, boutiques, and hacienda guest lodges. I’ll share all the places I stayed in upcoming posts. 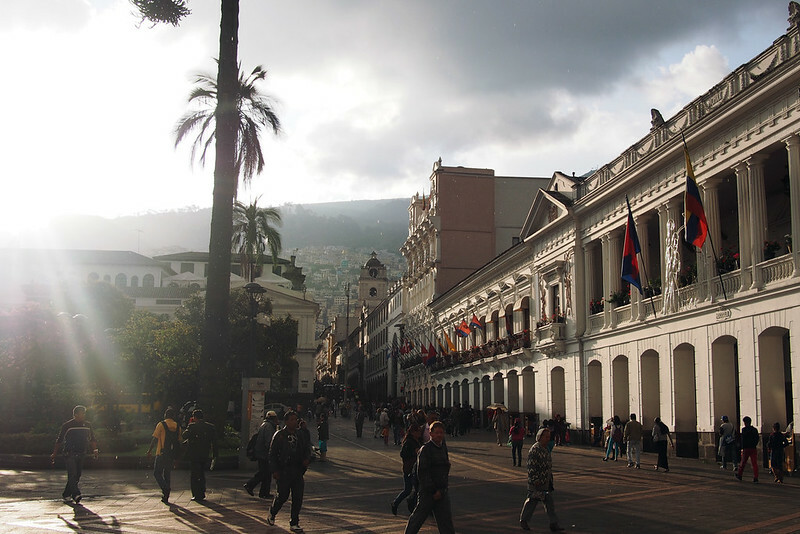 Ecuador is generally safe, stable and welcoming for visitors. It’s recommended that tourists, especially women, don’t walk around on their own late in the evening both in the city and countryside, but I didn’t feel unsafe anywhere. Spanish and Quechua (an indigenous language) are the spoken languages. Not many people speak English outside of touristy attractions, so knowing a bit of conversational Spanish would be very helpful in navigating and ordering food etc. 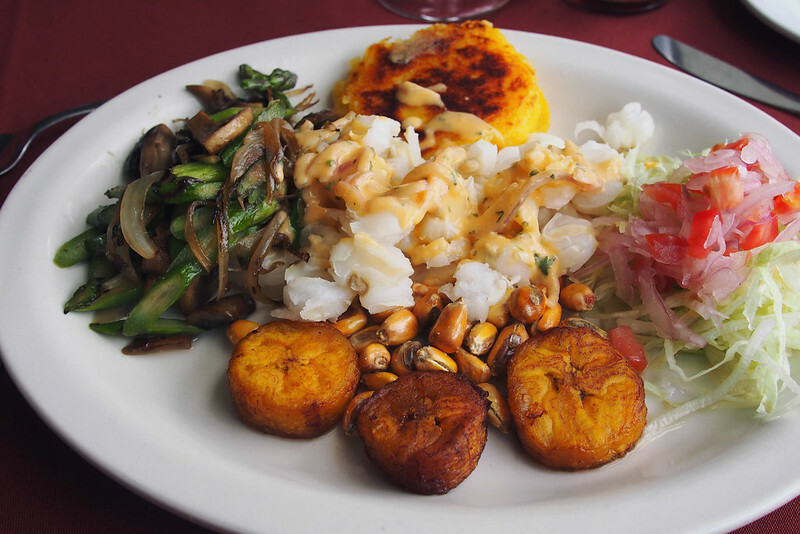 The local food is pretty heavy on meat and fish, and the concept of vegetarianism isn’t really understood – but everywhere I went had something I could eat, and the food was generally really great. Expect eggs, corn bread and fresh fruits for a filling breakfast with excellent homegrown coffee and a tropical fruit juice. Lunch is usually the main meal of the day and typically consists of a potato or quinoa soup to start followed by a a platter of meat/fish/veg with tortillas (here these are tasty thick fried discs of corn or potato), choclos (delicious crispy fried maize kernels), and a salad, plus a dessert of helado (sorbet / ice cream) or cake. I was usually too full to eat a large dinner! Cell phone signal is poor due to the valleys and mountains. Signal for calls is very hard to come by, never mind 3G, even in Quito. Most hotels and restaurants have wifi that you can use if you’re a customer. Just something to bear in mind if like me you are over-reliant on phone data for navigating and staying in touch with people! Quito was the base for my trip. This sprawling city of 1.6 million is split into the old colonial town (also called the historical centre) and the new town to the north. It’s a very easy city to navigate, being well-signposted, well lit after dark, and split into regular blocks with constant landmarks to help you get your bearings. I am terrible with directions and didn’t get lost once, even without my usual Google Maps crutch. However the public transport situation in Quito and the country as a whole is currently not great. 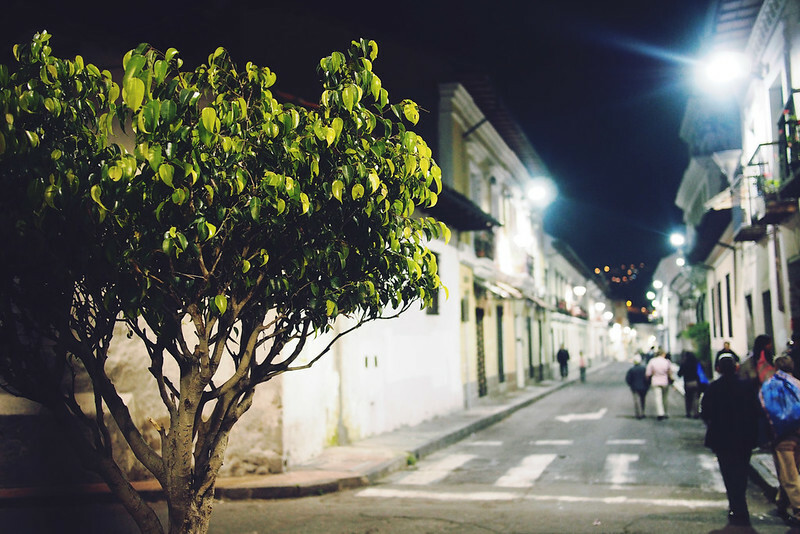 There is a lot of road traffic in Quito from locals using their cars to get everywhere, so walking around parts of the new town in particular can be a bit grubby and unpleasant. The government is working to improve this, with a new subway line and hybrid buses coming soon, as well as the promotion of cycling and no-car days. For now, taxis are plentiful and cheap if you get tired of walking, and the traffic eases up over the weekends. 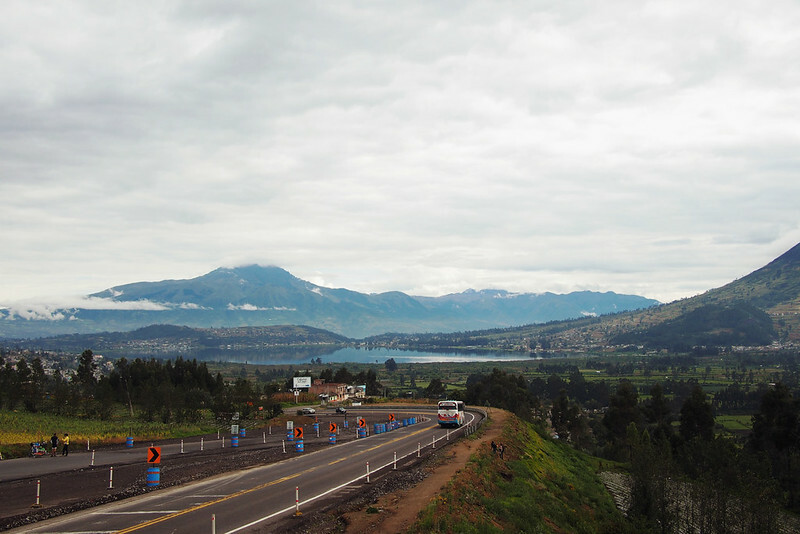 There is also construction in the works to open up new train lines between the major towns (Guayaquil – Quito – Ibarra – Otavalo – Salinas) which will make travelling the country less reliant on having a car. The first of these from Ibarra to Salinas is already open (and a stunning journey – more on that later) with more to follow later this year. This is great news because all of these towns are worth visiting and it’d make a great 2-3 week trip taking the train between them spending a few nights in each. Thanks for the post. I’m heading there early next year alone (probably in the wet) season, but its good to know its safe and that there is the option of trains (not just buses). Love the photo of the colourful shoes! Hi Ngaire. I’m from Ecuador and I’m very glad to read that you’re going to travel to Ecuador too. I want to tell you that trains are not the kind of trains in Europe. 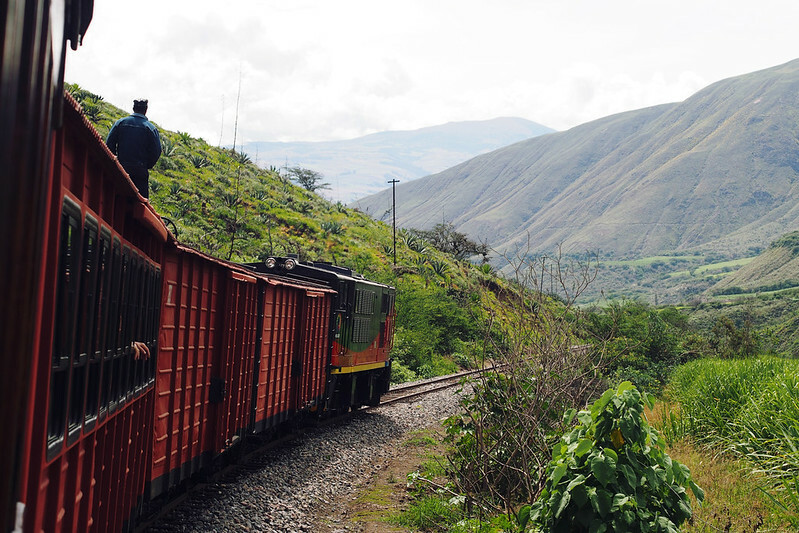 The train in Ecuador is a turistic one. If you want to check some info here in http://www.trenecuador.com you could find it. But the connections in bus are really cheap. I hope you’ll enjoy your trip. Thanks for sharing the extra info! I live in Quito! So glad you had a chance to visit our beautiful little part of the world. Nice! I went to Otavalo and Hacienda Pinsaqui as well! I have lived in Ecuador in Ecuador for 17 years and the security situation is not great. The article has really glossed over the fact that a lot of tourists are robbed. Be very aware and keep an eye on your bags at all times. Thanks for the input. I would say that there are so many police and specifically tourist police out on the streets (certainly more than London!) that I felt quite secure that I could ask for help if needed. As an outsider I didn’t feel a heightened need for security any more than for any other big city. There is no difference between Castellano and Español to be honest. The dominant form of Spanish spoken throughout Spain and Latim America is Castilian, with local differences in words and phrases similar to the difrerences between the English spoken in Australia, England and the United States. In Ecuador, in the Sierra, they use words taken from Kichwa, such as chuchaqui (hangover), and chachai (cold). A common word to express surprise is chuta! El Centro Histórico de Quito fue considerado por la UNESCO como primer PATRIMONIO DE LA HUMANIDAD, es decir, es de todos, es precioso y los esperamos. Cabe indicar que es el más grande y mejor conservado en América Latina. 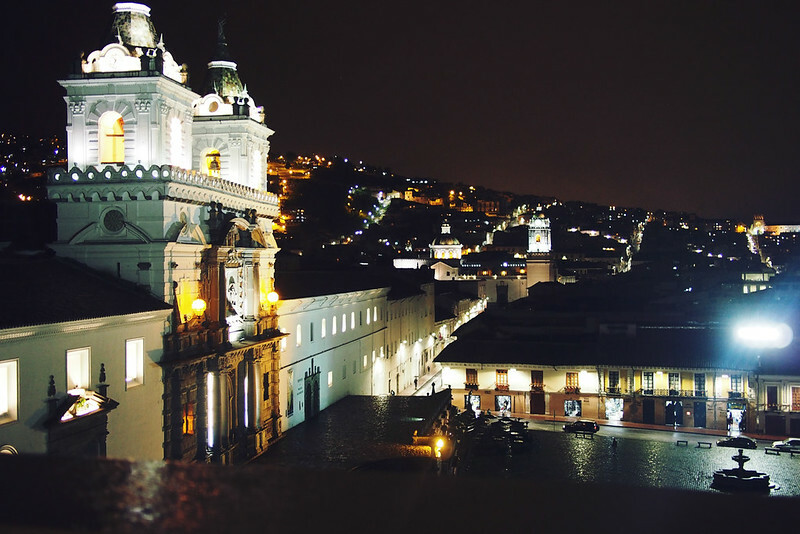 Quito is worth visiting. And staying for at least three days. Thanks for showing a picture of our street at Barrio San Marcos an emblematic neighborhood. 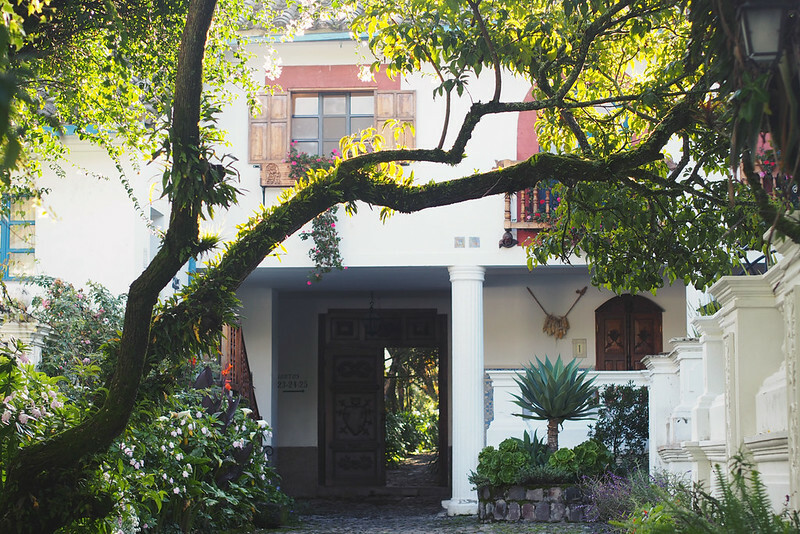 Our beautiful Casa San Marcos boutique hotel appears there, also the water color museum. Visit http://www.casasanmarcos.com and you could see why it has won trip advisors recognition. Thanks again to you! I had a lovely dinner on San Marcos, more on it later! As Ecuadorian and President of the Association of British Alumni in Ecuador, let me thank you and congratulate the article. The country is safe but you should be aware of the existence of pinpockets (as in any other city). In case you would need any assistance, we have constituted the “British Group” that gathers together: a) the British Embassy in Quito, b) the British-Ecuadorian Chambers of Trade and Industry, c) the British School in Quito, and d) the British Alumni Ecuador. Any help you would need, you can contact in advance the Embassy or any of us. See: https://www.gov.uk/government/world-location-news/be-part-of-the-british-alumni-ecuador-bae . Enjoy your trip to Quito and Ecuador. Ps: I loved the idea of not focusing ONLY on the Galapagos! Thanks for the input. There are also so many police and specifically tourist police out on the streets (certainly more than London!) that I felt quite secure that I could ask for help if needed. 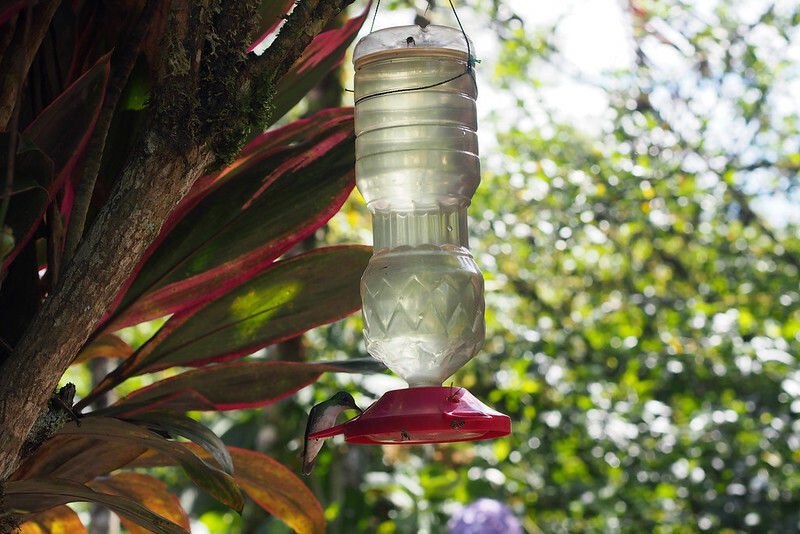 That’s the first photo I ever saw of a hummingbird sitting still. 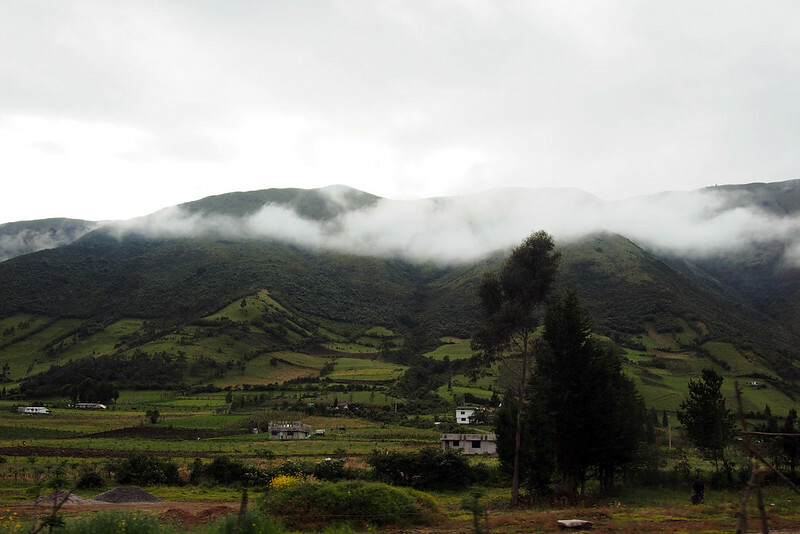 Great photos – you have captured the countryside and feel of Ecuador so well. Such a great country for exploration. Just discovered your blog and I absolutely love it! 6 years ago I traveled to South America, starting with a flight from Amsterdam to Quito just like you. We explored quite a lot of Ecuador before travelling on to Peru and all the way across the continent to the coast of Brazil. All your posts about Ecuador are making me reminisce about our wonderful time there. I hope I get to go back one day, it’s an amazing place! Thank you! I would love to go back too, there is so much to see there.